It’s Halloween and children are eagerly readying their witch’s hats and skeleton masks. However, unlike past years, costumes that aren’t as traditional are gaining more attention, marking the end of an era. Suddenly on websites and store shelves, five year olds are holding fake guns rather than wands and wearing Hitler mustaches rather than vampire fangs. Controversial costumes have always played a part on the night of Oct.31, but this year, costumes are portraying a different type of scary. The newest fad added to the crowded shelves? Costumes associated with Ebola. From patients and doctors, to quarantine suits for both children and adults, this deadly issue has turned into a joke. Some people, however, find controversial costumes more entertaining than the basic costumes that have been seen a million times. When citizens think of Halloween, images of pumpkins, witches, ghouls, and goblins erupt. As the world is changing, and the future is becoming more of a reality, traditional scary has reached its end. “I’m not saying Ebola, or any offensive costumes are okay, I just think people are trying to introduce a new era of scary,” said AHS senior Richard Wilkins. Among Ebola oriented costumes, consumers can find outfits associated with domestic violence, such as Ray Rice and his fiancé Janay Palmer masks, as well as apparel to portray Trayvon Martin. Americans have been taking to social media sites such as Instagram and Twitter to share their costumes, many gaining over 50 likes. Websites such as dhgate.com supply viewers with previews of their controversial merchandise. Ebola-themed costumes can be found in a variety of sizes, from children to adults with prices ranging from $70 to $80. “I definitely think there is a very thin line between funny and straight out wrong. Everyone has a different sense of humor, but some things should just not be posted,” said AHS senior Nicole Fontaine. Costume designers have eliminated the traditional scary costumes, and given real life fears a physical appearance. Nowadays, when people think of what scares them, they might think disease, war, and terrorism rather than Count Dracula and mummies. In order to keep up with the transformation of the public’s worst fears, costumes have incorporated just that. “The thought of ghosts still freak me out, but if I think about it, I guess things we hear about in society today are a bit more frightening,” said AHS senior Amanda Leek. From Ebola patients and Boston Marathon victims, to baby ISIS members, Halloween has transformed. A sick sense of humor is now required for Oct. 31, as there is no telling who or what might ring your door bell. This entry was posted in In & Around AHS, Teen Interest and tagged 2014-15, Costumes, Halloween, Juliana Araujo on October 31, 2014 by abeeahs. Attleboro High School (AHS) is happy to introduce many new and returning faces, including AHS 2007 alumni Ms. Christine Lyons, who is teaching English to freshmen and sophomores. “I enjoy being a teacher because I love sharing the English subject with others and it is one way to positively impact students’ lives,” said Lyons. “After teaching in Plymouth, I knew I wanted to return to give back to the AHS community,” said Lyons. She said that she received an excellent education in Attleboro, so wanted to continue adding to a community that helps so many students succeed. Lyons moved to Attleboro from Plymouth this summer. Lyons attended Amherst College to study performance studies with a concentration in film. “I was interested in studying film because I wanted to approach and study films the way I approached and studied literature,” she said. Graduating with a double major in English and sociology, she continued her education at Smith College earning a Master’s in Arts and Teaching. Lyons said, “I had a wonderful college experience.” She loved that her college was smaller than AHS because there was nowhere to hide; she had to become involved with school activities. “If I had attended a large school, I would have been very shy and wouldn’t have had much of an enjoyable time,” said Lyons. “I would suggest that students who want to become teachers study a wide variety of subjects, both in high school and especially in college,” she said. Growing up, Lyons played volleyball, but in high school she participated in a range of activities such as the Math Team, Amnesty Club, and the Environmental Club. If it was possible to travel anywhere in the world, Lyons would visit her relatives in Ireland. She has not yet met them and thinks it would be an interesting experience. 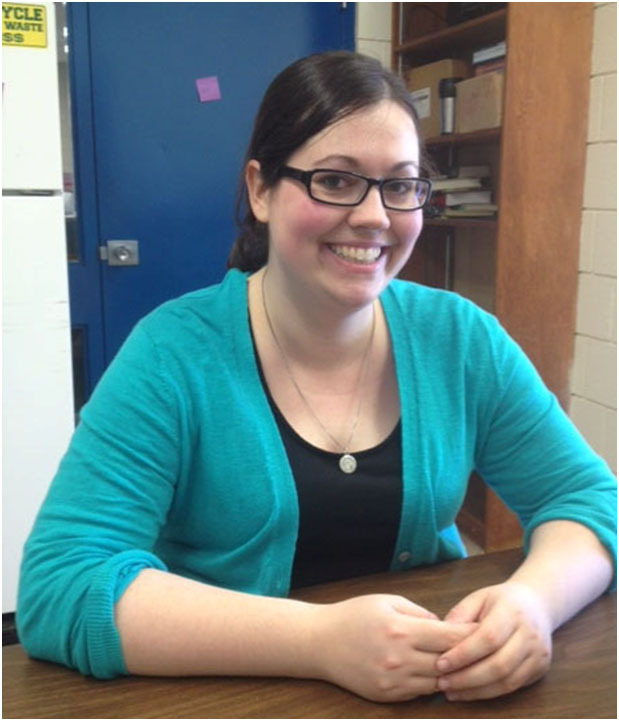 This entry was posted in Home, In & Around AHS, Teacher Interviews and tagged 2014-15, Attleboro High School, English Department, Interview, Marie Urmson, New Teacher on October 31, 2014 by abeeahs. September is Childhood Cancer Awareness month and is a reminder that childhood cancer is a real battle that many families are forced to face due to no fault of their own. In Oct. 2013 Danny Nickerson from Foxboro, Mass., age six, was diagnosed with an incurable brain tumor known as diffuse intrinsic pontine glioma, or more commonly known as DIPG. One hundred and fifty to two hundred children between the ages of five and ten are diagnosed with DIPG each year. They are only expected to live for nine to twelve months after a diagnosis is confirmed. The Nickerson family pretends that everything is normal and they still do fun things with their children as if there is nothing different in their daily lives. They go to the zoo, the aquarium and many other places. Danny and his younger brother Matthew “are like two peas in a pod,” said Murphy. 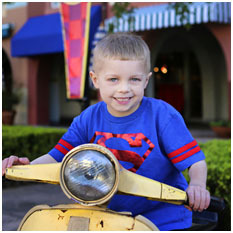 He is not defined by his cancer though, and like many boys his age, he is interested in a variety of things. “He loves camping and animals; has two puppies, Luigi and Rosy; owns lots of legos and skylanders; enjoys riding his power cars; and playing Mario,”said Murphy. Since he is so young, he does not know too much about his condition, but wants to become a doctor or a fireman when he grows up. “He knows he sees a doctor and gets tested a lot. He has no clue for what though … just a head boo-boo,” said Murphy. If there was anything someone was to take from this article, Murphy said that she would hope they understood the main picture. “Danny is a six year old little boy fighting for his life right now. We, as a family, are taking it one day at a time. This is a terminal disease and needs to get more awareness,” said Murphy. On Danny Nickerson’s page, Carly Nickerson, Danny’s mother, posts about her sons, shares pictures, and also adds links to other websites of children diagnosed with DIPG. Over fifty thousand people have “liked” the page and many of them share their own stories dealing with childhood cancer. Nickerson’s family has also been raising money to pay for the cost of Danny’s medical bills. They have set up a gofundme account in hopes of raising $15 thousand. This entry was posted in Home, In & Around AHS, Personal Stories, Teen Interest and tagged 2014-15, Cancer, Foxboro, Massachusetts, Sydney West on October 31, 2014 by abeeahs. 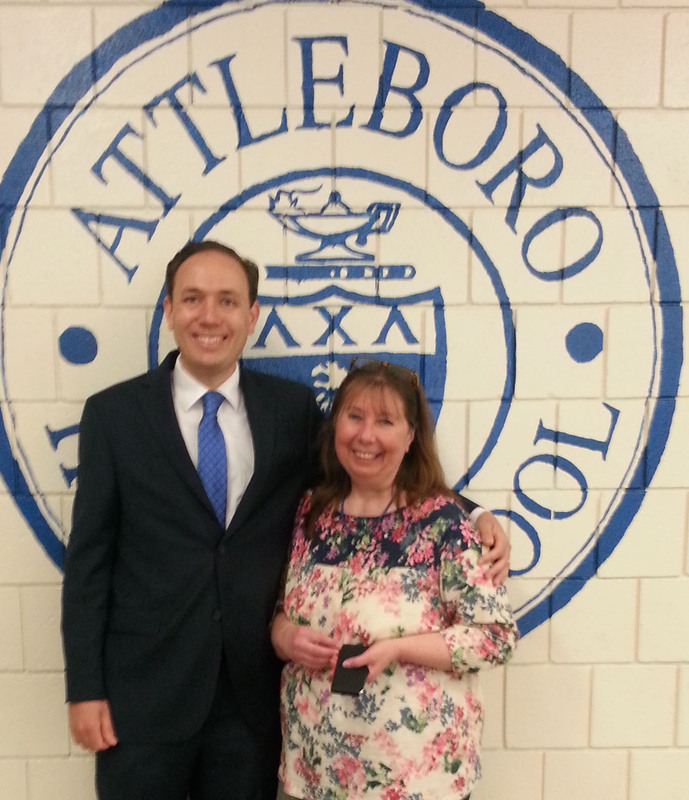 Former Deputy Assistant Secretary of the Office of International and Foreign Language Education at the US Department of Education Herbert Claiborne Pell IV visited Attleboro High School (AHS) on Friday Sept. 26 to speak with students at the request of health teacher Mrs. Nancy Krieger. Pell is 32 and recently ran in the Democratic primary for Rhode Island governor. Gina Raimondo won the race against both Pell and Providence Mayor Angel Taveras and is now running against Republican candidate Allan Fung. “ I liked him as a candidate because he was young and had a fresh new opinion on important matters. All the people who supported his campaign were also young and I liked the enthusiasm they brought to the campaign,” said Krieger. Pell’s grandfather was the senator who created Pell grants, a way to help students pay for college, and made great strides for education. The grants originally covered the full cost of a four year public college. Now they don’t even come close. Pell wishes that students were not forced into massive amounts of debt when they choose to pursue their educational careers. “It is wrong what this country is doing to the kids in America,” said Pell on student debt and the cost of college. As the cost of an education rises, more and more citizens are being held back by their student loans. If Pell could control the system and delegate money, he would help students so that college was a more affordable option. “ It was pretty great that he came. It’s nice to hear that somebody understands how broken the education system in America is. It’s refreshing to hear from a politician,” said AHS senior Matt Girczyc. In his campaign for governor, Pell’s major issue was education. He believes that America needs a new generation of thinkers for both politics and the media. In his opinion, the media needs fresh faces that the world can trust to tell the truth. Pell’s biggest roadblock during his campaign was making sure the correct message was projected through the media. Pell attended Harvard University and then continued his education at Georgetown University Law Center. He began his career in the United States Coast Guard and was a judge advocate (prosecutor) for the military. “ I liked how small it was and the sense of community. Because people didn’t know each other, we got to experience bigger leadership roles and comradery,” said Pell about his experience in the Coast Guard. He has held many jobs in government, including Director for Strategic Planning on the National Security Staff. Pell speaks four languages and enjoyed his last job in the foreign language department very much. When applying for a job at the White House (the White House Fellowship) Pell met Michelle Kwan, who was also interviewing for the fellowship. They began dating and a year later, they were married. Pell always knew that he wanted to dedicate himself to public service but was not positive that he wanted to be a politician. “I made my own decision to run for office but my grandfather definitely had an impact on me. He made me positive that I want to make a difference in this world,” said Pell. This entry was posted in Home on October 31, 2014 by abeeahs. The movie adaption of James Dashner’s dystopian novel, The Maze Runner, premiered last September in more than 3,000 theaters nationwide. Rated PG-13 for its violence and disturbing images, it was directed by Wes Ball and stars teen heartthrob Dylan O’Brien, who plays a teenage boy, Thomas, who finds himself trapped in a box that’s quickly rising. The box comes to a shuddering stop and is opened quickly from the top, shining bright light on the confused young man. As he is helped out of the box by strange boys, he takes in his surroundings and immediately starts to run. He trips and the other boys catch up to him, and begin the long task of explaining how he arrived in his new home, the Glade. Thomas is confused because no one seems to know very much; the only thing they remember is their own names. As Thomas begins to understand his prison, so does the viewer. The Glade is surrounded by massive stone walls that partially open during the day to let “Runners,” out into a large maze that changes every night. The boys are attempting to find a way out of the maze but the Creators of the maze have made escape hopeless. 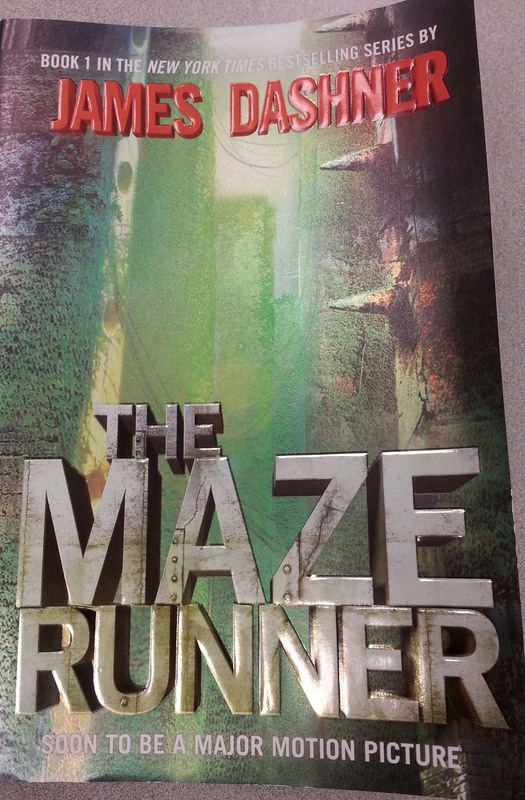 Thomas refuses to accept his own fate and pushes the limits of the rules and the other boys in the Glade follow. When they realize he is more willing to take risks than the rest of them, many of the boys become afraid, but others admire him for his bravery. One boy, Gally (Will Poulter), does not like Thomas from the beginning and terrorizes him throughout the movie by bullying him and acting out against him. Others, like, Chuck (Blake Cooper) and Newt (Thomas Brodie-Sangster) stick with him even through all of his problems including breaking the rules of the Glade and devising a plan to escape. Every move the teenagers make is in the hopes of escaping the maze and finding out what or who transported them there. They intend to destroy the creators of their prison and find a way back to civilization. This movie was impressive in both its exceptional acting and unusual plot line. However, it differed from the book in many ways, which took away from the overall effect. Only one of the large stone doors to the maze opened every day whereas in the book, all four opened daily. Also the Gladers didn’t receive a serum to help with pain from a sting from the Grievers, monsters that live in the maze, until the movie was almost over, but in the book, they were given it from the beginning. This helped the leaders save more people from grief and pain throughout the book. Production of The Maze Runner cost an estimated $34 million and the movie made a little over $32 million in its first weekend. Because of the high turnout for the first movie, shooting for the second movie, The Scorched Trials, will begin soon and be released in 2015. The Maze Runner deserves four out of five stars for its realistic acting and riveting plot line. This entry was posted in Entertainment, Movies, Teen Interest and tagged 2014-15, Attleboro High School, Dylan O'Brien, Movie, movie reviews, Reviews, Rose McDermott-Pinch, The Maze Runner on October 30, 2014 by abeeahs. A fresh year at Attleboro High School (AHS) once again ushered in a whole class of new students, along with a few changes, just months after saying goodbye to the 2014 seniors. To the incoming freshmen, everything about AHS is a huge change compared to the three smaller middle schools. “The biggest differences between high school and middle school are the facts that you can chew gum and choose your own classes. You can use electronics when not in class and teachers aren’t as strict,” said freshman Rebecca Packard. One change to this year’s schedule was the swap from Friday to Thursday for advisory. Half-days also changed from Wednesday to Friday. The Advisory switch doesn’t have much of an effect on students’ social lives and how much weekend or after school time they have; however, the half-days on Friday are very important. “I love the half days on Fridays. It makes the week so much more bearable,” said Astrofsky. In addition to the schedule changes, some minor rule changes were made. There are now some inconsistencies with the handbook and what deans offer for discipline. Many violations that call for a session — or one-hour detention — are not enforced. Instead, the offender receives a warning. In the handbook, “Public displays of Affection” is listed as a “Group I” violation, allowing up to two one-hour sessions as discipline. However, many students only received a warning, even if they were repeat offenders, as witnessed by other students. “My sophomore year I used to see the same couple making out in A building every day. The same few teachers would tell them to break it up, get moving, go to class, and then there they were, the next day, making out again,” said senior Avianna Cascio. So, when is it handled by a dean? Runey also noted that when teachers don’t follow through with their promises of discipline, the students take advantage of it. They continue to break rules without punishment. Another rule change, which many seniors are not yet aware of, is that having a 90 or above in a class doesn’t exempt them from taking finals. The 2013-2014 school year was the last year that seniors would be exempt from finals, meaning that the entire Class of 2015 is required to take every final. Some seniors have different views about the final exams and standardized tests in general. Before the switch, seniors worked hard to achieve that 90 or above just so they wouldn’t be required to take the final. Seniors who still work hard to achieve a 90 have strong opinions about the change. “I shouldn’t have to do extra work for a class that I’ve already proved my mastery of,” said Cascio. “I would say that the standardized tests [finals] don’t determine learning accurately. If a student is capable of keeping at least a 90 throughout the term then they don’t need to take the final, because it’s clear that they know what that class is teaching. If they choose to take it, though, and it hurts their grade, then the test shouldn’t be counted. It’s dumb, though,” said senior Eric Barrese. Most of the basic rules, however, haven’t changed. Students still aren’t allowed to wear hats or hoods, skateboards should not be carried in the hallways, and students must wear appropriate clothes for the classroom, science lab and technical education classes. Despite all the new things that students and staff alike have to adjust to, this year should be just like any other. This entry was posted in Home, In & Around AHS, Teen Interest and tagged 2014-15, AHS, Amanda Hansen, Bill Runey, Finals on October 30, 2014 by abeeahs.